Jane Christmas is a Canadian writer whose subjects are right up my alley. I recommend them all, if the titles/subtitles appeal to you. I have seen some pretty critical reviews of her books, and can see their points, but a writer can’t be all things to all people. Personally, I look forward to her next book. Here is her website. 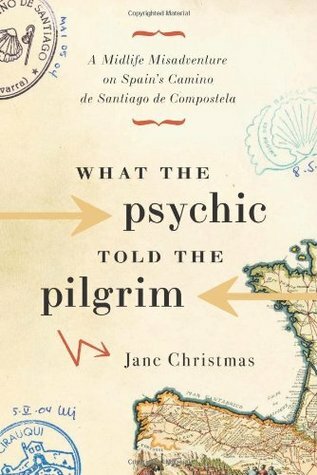 What the Psychic Told the Pilgrim: A Midlife Misadventure on Spain’s Camino de Santiago de Compostela (2007) – As with her other books, Christmas starts with a rather absurd idea, makes an adventure, and describes it with humour, honesty and historical information. The humour and honesty make her look like an idiot at times, but that’s good for the reader. In this book, the absurd idea was that she could gather together 15 women – friends, acquaintances and strangers – and they could happily walk 800 km together! It was a bit off putting to the disinterested reader, but not to me. No, no, no, I am not easily put off and intend to set off on that same journey in October. Definitely without dependent companions though! 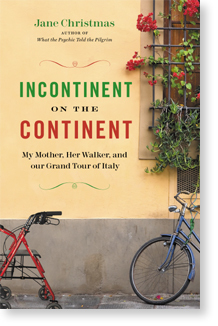 Incontinent on the Continent: My Mother, Her Walker, and Our Grand Tour of Italy (2009) – In which Jane takes her elderly mother to Italy. I mainly enjoyed this because it reassured me that I’m not the only daughter in the world who has had a fractious but fundamentally loving relationship with her mother. The last trip I tried to take with my mother ended with her coming down with shingles, and that was pretty much the end of any thoughts of adventure/fun with her. I made a point of getting a shingles vaccine for myself after that! 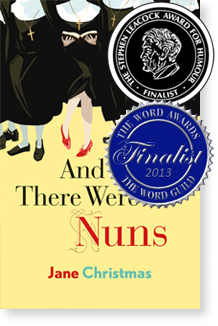 And Then There Were Nuns: Adventures in a Cloistered Life (2013) – In which she spent a few months in several convents to determine if she should become a nun, as an alternative to marrying the guy she met on the Camino (see book review above). Duh! I found the premise a little disingenuous (a word I love to use occasionally) since it was so unlikely that nunnery would win. On the other hand, a writer needs to make a living, and it would have been quite interesting as a research project. I believe that she does have a genuine commitment to her faith and the practice of it. Further, I believe that she entertained the fantasy idea, “I wonder if I could be a nun,” throughout the process. In any case, the book gave some insight into modern convents of the Anglican Church or Church of England, something I hadn’t been much aware of. Christmas has written another book (her first) that I must seek out… The Pelee Project: One Woman’s Escape From Urban Madness. What does it mean to be a modern-day nun? Interesting you did three books by the same author. It was a good introduction to Christmas. Thanks. I think they make a package since they are very much the author’s personal voice, yet very different situations.